^^Oh, the audio is from that 'Beatle Speech' thing. Naughty Lennon. 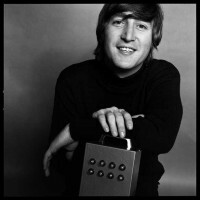 John Lennon with his UFO detector. It took almost a decade to finally summon the UFO. At least it finally worked. The Beatles had just played at Shea Stadium. John had picked up this box that basically had a switch on and off and the lights just flickered intermittently from one to the other arbitrary. John said it had been sold as a UFO Detector and he brought it along to the session. It was a funny prop that he just picked up in New York. Isn't UFO Detector kind of an oxymoron? A UFO is unidentified. You can't detect what it is. 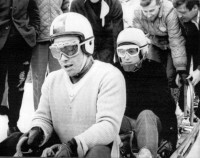 Wearing crash helmet and goggles, Beatle John Lennon , right, sits in the brakeman position for a bobsled ride with British Olympic Gold medallist Tony Nash, at St. Moritz, Switzerland, Feb. 8, 1965. Lennon was on a private skiing holiday with his wife, Cynthia, unseen. Picture of John eating a hot dog from a set of unseen pictures from the time they were filming Help ! The pictures are going up for auction. 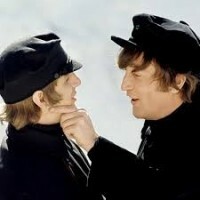 An archive of unseen Beatles photographs will lead a sale dedicated to Fab Four memorabilia at Omega Auctions next week. The incredible collection features behind the scenes images from the band’s 1965 movie Help !, taken on location in Austria by the German photographer Bernd Kappelmeyer. The archive, which includes 124 black and white negatives, will be sold with full copyright and is expected to sell for £10,000 – £15,000 ($13,175 – $19,700). The sale will also feature another collection of negatives, taken in 1967 at the Saville Theatre in London, as the band filmed promotional footage for their single Hello Goodbye . 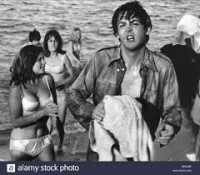 The 36 photographs depict the band performing on-stage, in a film directed by McCartney himself, and will offered with copyright for an estimate of £6,000 – £8,000 ($7,900 – $10,500). Further highlights from the special auction include a set of original patterns for the band’s famous Sgt Pepper suits, made by tailors Bermans of London, estimated at £4,000 – £6,000 ($5,250 – $7,900); an original set of Victorian street sign tiles from Abbey Road , also valued at £4,000 – £6,000; and a variety of rare vinyl albums, autographs and vintage concert flyers. The Omega Auctions Beatles Collection Sale takes place at Newton-Le-Willows near Liverpool on October 13. Is it john or you saying that? Yah. I sent an email to the other mods to get their opinion on it. 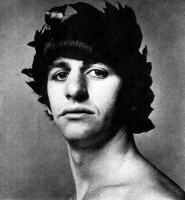 Whoa, with the moptop that he wouldn't get when he was with the Beatles.